Glenn Williams came to lunch recently bearing gifts. Williams, the benefactor responsible for a more than 12-foot high sculpture that will grace the Four Diamonds Sports Complex later this spring, brought a precede of what’s to come to a recent luncheon with university and CU Foundation officials. 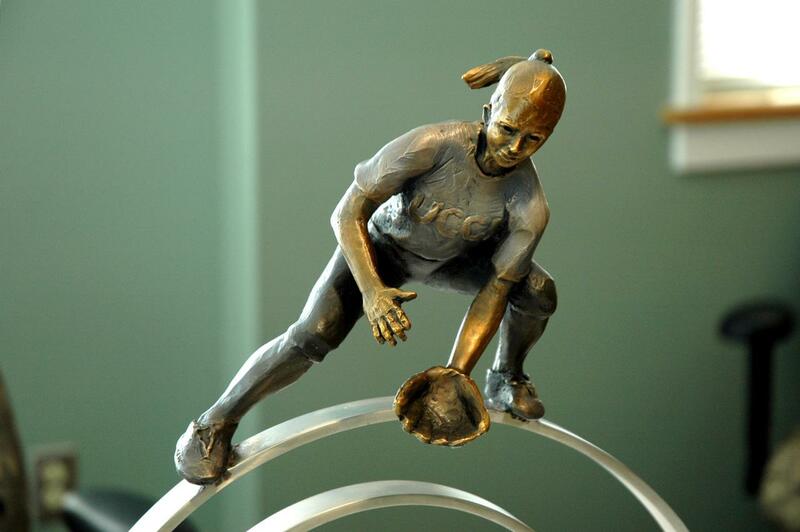 Williams brought a 12-inch-tall bronze “mockette” of a woman softball player wearing a UCCS jersey to the luncheon. The piece was created by Loveland sculptor Denny Haskew as he prepares to create a full-size version for placement at Four Diamonds to signify the importance of women’s athletics. The small version served a test of proportions as Haskew moves from clay mock ups to production of the final piece. The pint-sized sculpture garnered praise at the luncheon with Williams which was attended by Chancellor Pam Shockley Zalabak, Gary Reynolds, executive director, Facilities Services; Steve Kirkham, director, Athletics, and Megan Fisher, director of development, CU Foundation. Later, the “mockette” found a place in Shockley-Zalabak’s office. Formal ceremonies to unveil the completed sculpture are expected late this spring and will be announced. 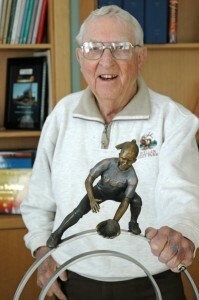 To read more about the sculpture and Williams’ gift of it to the university, see http://communique.uccs.edu/?p=2698.